3-Olive Eve Walker was born on 13 May 1884 in Westbury, Tasmania, died on 5 Dec 1973 at age 89, and was buried in Dec 1973 in Deloraine Cemetery. 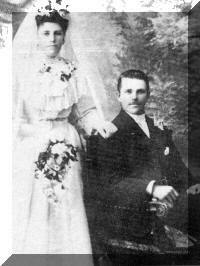 Olive married George Hubert Cox, son of Joseph Cox and Agnes Wilson, on 12 Aug 1907 in Parkham, Deloraine. 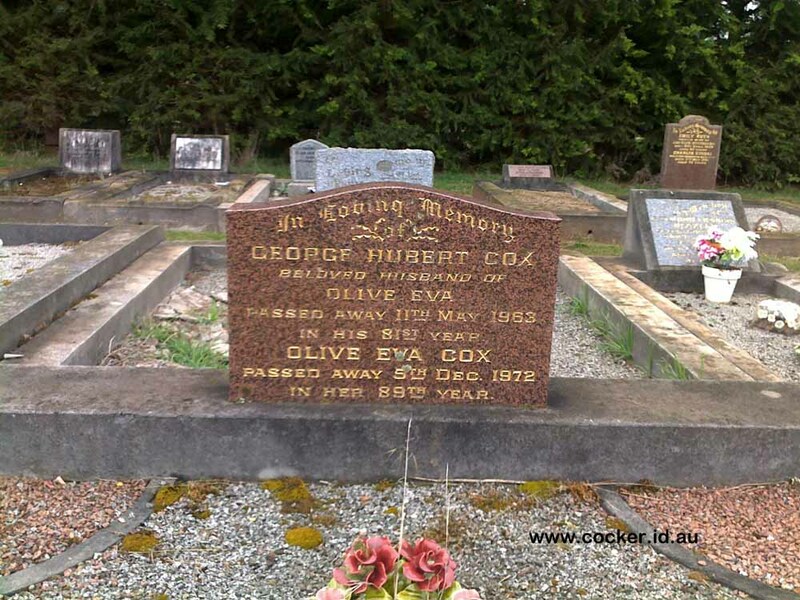 George was born on 30 Oct 1882 in Deloraine, Tasmania, died on 11 May 1963 in Deloraine, Tasmania at age 80, and was buried in Deloraine Cemetery. George and his father had some excellent farmland on their property and grew good crops of horse beans, golden tares, peas, oats and other crops. George had a horse team with which he carted wheat and other grains to Harvey's Flour Mill at Deloraine. Olive was a magnificent cook and became known for her old-fashioned sponges, apple pies and mouth watering pastries. She made beautiful floral bouquets, was a clever seamstress and could run up a smart, tailored suit in no time at all. Olive and George lived in a small cottage on his father's farm, until his father died and his mother retired to live in Deloraine. They then moved into his parents' home until they too retired to Deloraine. George was 81 years of age when he died and Olive was 89. Wealthier farmers and businessmen in the early 1900's were able to send their daughters to classes, piano playing, singing, millinery, needlework, dressmaking, painting, the violin, besides cookery and other skills. But not so the majority of small farmers. After their schooling their daughters continued at home, helping with the housework, farmyard chores, milking, cooking and sewing. This was the lot of Michael and Charlotte's three daughters. However Charlotte was a good mother and taught her daughters to be efficient and industrious in preparation for becoming homemakers themselves. 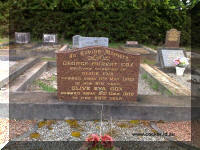 4-Clifford George Cox was born on 11 May 1909 in Parkham, Deloraine and died on 11 Feb 1981 at age 71. Clifford married Christina May Chilcott, daughter of Charles Ernest Chilcott and Lily May French. Christina was born on 18 Mar 1909 in North Motton, died on 11 Dec 2006 in Grenoch Home, Deloraine, Tasmania at age 97, and was buried on 14 Dec 2006 in Service at Uniting Chucrh, Deloraine. They had three children: Olive Lily, Gwenneth May and Wendy. 5-Olive Lily Cox was born on 4 Nov 1935. Olive married Robert George Loone. Robert was born on 17 Jul 1940. They had four children: David George, Lynette Ann, Janice May and Peter Robert. 6-David George Loone was born on 18 Dec 1964. 6-Lynette Ann Loone was born on 29 May 1966. 6-Janice May Loone was born on 8 May 1968. 6-Peter Robert Loone was born on 29 May 1970. 5-Gwenneth May Cox was born on 22 Nov 1941. Gwenneth married Desmond Ronald Jordan on 22 Dec 1962. Desmond was born on 11 Dec 1940. They had three children: Debbie Trina, Phillipa D'Arne and Jason. 6-Debbie Trina Jordan was born on 21 Apr 1965. Debbie married someone. She had two children: Tarnea Natasha and Matthew Lee. 7- Tarnea Natasha was born on 28 Mar 1984. 7- Matthew Lee was born on 15 Jul 1985. 6-Phillipa D'Arne Jordon was born on 27 Sep 1967. Phillipa married David Thomas Cox on 22 Mar 1986. David was born on 15 Nov 1964. They had one daughter: Chrissie Reanne. 7-Chrissie Reanne Cox was born on 25 Jun 1991. 6-Jason Jordan was born on 30 Jan 1972. 5-Wendy Cox was born on 21 Dec 1946. Wendy married Gregory Philips. Gregory was born on 16 Oct 1946. They had two children: Adam and Rowena. 6-Adam Philips was born on 10 Oct 1969. 6-Rowena Philips was born on 25 Nov 1970. 4-Jean Mynette Cox was born on 9 Feb 1913 in Parkham, Deloraine. Jean married Collis Norman Arthur Chilcott, son of Charles Ernest Chilcott and Lily May French. Collis was born on 6 May 1905 in North Motton and died on 14 Sep 1985 at age 80. They had two children: Beverley Jean and Graeme Geoffrey. 5-Beverley Jean Chilcott was born on 4 Aug 1937. 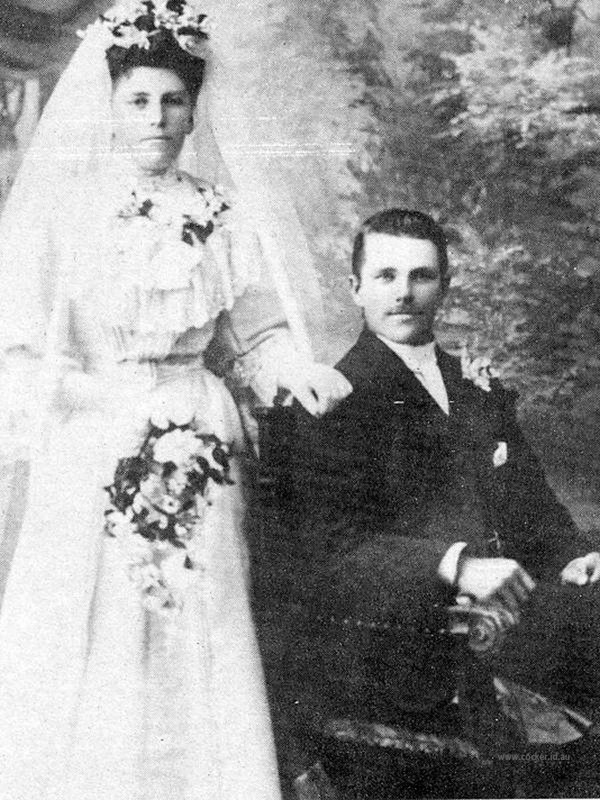 Beverley married Maxwell Leidle. Maxwell was born in 1936. They had two children: Brian Maxwell and Carolyne Anne. 6-Brian Maxwell Leidle was born on 20 Aug 1964. 6-Carolyne Anne Leidle was born on 9 Mar 1967. 5-Graeme Geoffrey Chilcott was born on 18 Sep 1939. Graeme married Jennifer Mary James. Jennifer was born on 8 Mar 1941. They had two children: Maree Elizabeth and Kathryn Anne. 6-Maree Elizabeth Chilcott was born on 22 Sep 1964. 6-Kathryn Anne Chilcott was born on 1 Nov 1965.